Yet Another Vintage of the Century? When the world’s most influential wine critic, Robert Parker, announced that he was not going to Bordeaux this Spring to taste the new wines (from 2014) there was a wave of surprise in Bordeaux and a wave of apathy in its markets. 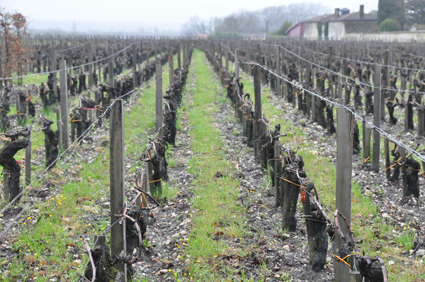 For many decades, Bordeaux has sold its wines via the En Primeur ‘futures’ system. The new wines, although still not finished either in terms of maturation or assemblage (blending) are made available to taste in April of the year following the vintage. 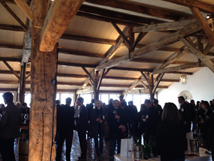 Shortly after this, the châteaux release their prices, and consumers can buy the wines at this stage. Originally, and for many years, canny customers could save a great deal of money on the prices that the eventual bottled wines would reach when they came on to the market, having provided profit margin for many distributors, wholesalers, importers and retailers in the interim. En Primeur overcame the problem in Bordeaux that the châteaux rarely had cellars capable of storing many vintages of maturing wine, in the way that wineries in Rioja and elsewhere have. It is difficult to dig underground in Bordeaux (the water table is quite high – indeed the Médoc is simply a drained river bed), and without this, warehousing – already expensive – could not afford the optimum conditions for long-term storage of wine. Of course with the advent of more sophisticated construction methods, waterproofing and air conditioning, this motive has largely dissipated. Any visitor to Château Pichon Longueville-Baron in Pauillac can attest to the magnificence of today’s underground construction, and anyone who has seen the less pretty but equally functional temperature-controlled warehousing of the distributor/negoçiant Joanne in Carignan-de-Bordeaux can witness the perfect storage conditions. Consumers, unable to taste in person, placed orders based on the preliminary comments and advice of their brokers and importers. In the 1980s this started to switch to the independent scores awarded to the painfully-young wines by critics such as Robert Parker. As Parker himself was keen to point out, there was much yet to happen to the wines before they became drinkable, including the blending and maturation. He only ever scored points in a range, and with the caveats that the finally bottled wines might score significantly more, or less, than the six-month old juvenile samples. Nevertheless, with no other independent information to go on, if Parker gave it a high score the demand, and price, went up. Eventually the châteaux would only release their prices after Parker’s Wine Advocate scores had been published. People have, unfairly, blamed Robert Parker and the other wine critics and publications for this. The problem with the system was and is, in essence, greed. Once, consumers could purchase, say, 1982 wine En Primeur and save huge amounts of money versus the price the final bottled wine would sell for. Eventually it stopped being people who wanted to drink the wine affordably who were buying the wines, but instead people with the specific aim of trying to make money from doing so. This led to an increase in demand and prices. 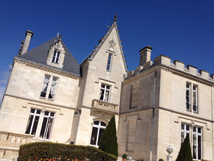 The producers started imposing quotas in order to buy, for example, Château Lafite-Rothschild, customers also had to commit to the purchase of their second wine, Carruades de Lafite, and the group’s exquisite, but less in-demand, Sauternes property, Château Rieussec and so on. Tacit agreements to purchasing each vintage rather than only selecting the great ones were also made. This greed on the part of speculators inevitably led to greed on the part of the producers too. After all, why should investors and middle-men make more money out of a product than the people who had toiled actually to make it, risking the weather and so on? The advantages of buying En Primeur became fewer and fewer. Even if it is less expensive, the costs of tying up money, and not receiving the wine for years, were coupled with the risks that what would end up bottled might be different to, not as good as, and scored lower, than the En Primeur samples. By the late 2000s the prices that the Château were releasing were so high, that two factors presented themselves. Firstly, it was often possible to buy already bottled wine from just as good, or even superior, vintages in the market, and these wines were guaranteed, immediately available, and significantly more ready to drink. 2005 is a monumentally superb vintage. The scores were high, and the prices higher. Nevertheless the prices in the market had made a lot of speculators a great deal of money by having bought them En Primeur. At least if they sold them quickly. By the time the prices for 2009 and 2010 – two further exquisite vintages - were released, it was possible to buy the 2005 wines in the market for less than the En Primeur release prices of 2009 and 2010. Of course, in between 2005 and 2009 there had not only been two less than stellar vintages in Bordeaux, but a worldwide financial crash. 2010 was a wonderful, perfect vintage in Bordeaux. But the people who purchased it En Primeur ended up losing money. Quite a lot of money. For some time, there had been no massive financial advantage to the early commitment, but for the first time, global economic issues, coupled with the anti-corruption moves in the biggest emerging market, China, meant that purchasing En Primeur has failed, even for great wines. A recent report from Liv-ex, the London-based fine-wine exchange, details that En Primeur customers have lost money for the past five vintages. Château Latour announced that they were going to withdraw from the whole system (from 2012), and keep the wines in their own cellars for longer, releasing them to the market gradually, and avoiding speculators making money out of what is, after all, a drink. However, their own internal pricing mechanisms have not meant that this has resulted in bargain Latour for the consumers - not yet anyway. There still remains in Bordeaux a hierarchy of Châteaux, Courtiers, Negoçiants, and Wholesalers, and this system will take many years to dismantle itself. Latour have much to lose, and little to gain, by deliberately upsetting everyone else by releasing inexpensive prices. What then happened in Bordeaux made things worse. The three indifferent vintages of 2011, 2012 and 2013 left the producers with some extraordinary dilemmas. With today’s modern technology and methods, it is possible for top producers to make good wine irrespective of the weather, and there are many good wines, possibly even some truly great ones. But as vintages in general all three were poor, with no potential to become regarded otherwise. How on earth could the châteaux adjust their prices to reflect this, without making the admission that they had overcharged previously? Not great though the years 2011-2013 had been, the wines had not cost any less to make. The prices were reduced, but by nowhere near enough. The sales campaigns ranged from a disappointment to a disaster. Much wine remains unsold today. The last poor vintage in Bordeaux, 2007, at least had the advantage of being small in quantity and easier to sell for that reason. The great hope was that 2014 would provide a chance to correct all this. Until August last year things looked very promising, it was shaping up to be a very good vintage. Rain late in the month bought relief from the dryness and heat of July, helping and probably improving the Cabernet Sauvignon, but it was too late in the season and close to the harvest for Merlot. As a great generalisation, Merlot was harvested either wet, or late. Nevertheless, 2014 is a really good vintage. It easily eclipses 2013, 2012 and 2011, and probably has the edge on 2008. No-one is claiming, however, that it is on the same level as 2010 and 2009. Conversely, if the prices for 2014 were a great deal higher than those for 2013, then this risks the 2014s remaining unsold too, making the problem worse. There is still plenty of well priced wine available in the market. Not much point purchasing the 2014 Château X, when the similar quality 2008 can be purchased for 20% less, and delivered the following day. Most Châteaux have gone for a small increase, around 12% on average, on the 2013 prices. This is fair enough in terms of quality, but seems likely further to contribute to the failure of the En Primeur system. I had the privilege to taste most of the 2014 En Primeur wines in Bordeaux, with and courtesy of Steven Gu of Jubilant Nova. There are some lovely wines, and the coolness of August has provided them with a fresh, lively acidity, and less alcohol, than recent blockbuster warm vintages. The 2014s will be delicious to drink relatively young, and will be approachable far earlier than, say, 2010, and perhaps even 2005. They will in consequence not need or deserve long term cellaring. Should you buy them? The short answer is ‘yes’ if you want to drink them, but ‘no’ if your aim is to make money from having bought them. Look for the wines and communes high in Cabernet content, the late ripening Cabernets: Sauvignon (in the Médoc) and Franc (in St Emilion and Pomerol) have performed very well. 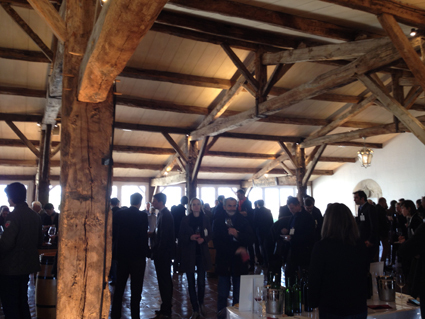 St Estèphe, the most northerly of the Médoc’s communes has made some especially terrific wines. Names to look for include Châteaux Montrose, and Calon-Segur. 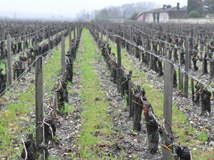 The high Cabernet content Graves properties of Pape-Clément and Malartic Lagravière are excellent. 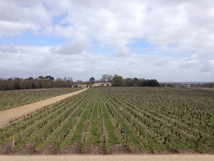 Within Margaux, a particular star was Château Palmer, who have crafted a sensational wine, especially given their relatively high percentage of Merlot in the vineyards. This may well be because for the first time, and on their 200th anniversary, they are certified Biodynamic. Of the big names – all of which are reliably great wines – the top properties are Cheval Blanc, Vieux Château Certan, Mouton-Rothschild, and Lafite-Rothschild. Is 2014 at the right price? Only time will tell.